Autorice™ Digital Manometer & Controller System - Gilson Co.
SG-35 AutoRice™ Digital Manometer / Controller precisely measures vacuum and regulates the vacuum pressure setting and time. The device can also be equipped to monitor shaker vibration energy during theoretical maximum specific gravity testing (Rice Test) of hot-mix asphalt samples. Careful control of these three important factors can mean dramatic improvements in inter-laboratory repeatability and accuracy. Variations in acceleration and frequency energy produced by rice shakers can create repeatability issues as well as cause stripping of the sample. Actual shaker energy profiles have not been monitored up until now, and accurate measurements helps establish parameters for adjustment of settings between different shakers. With the push of a button, the AutoRice™ Controller starts the vacuum pump, regulates vacuum pressure, controls vacuum time and displays vacuum pressure. The optional SGA-126 Shaker Sensor is purchased separately, attaches to the pycnometer and is connected to the controller’s USB port to measure vibration acceleration and frequency. Data from the sensor can be used to calculate a “shaker factor” to establish proper vibration levels. The Controller is easily set up with menu driven software, and replaces traditional analog or digital manometers. 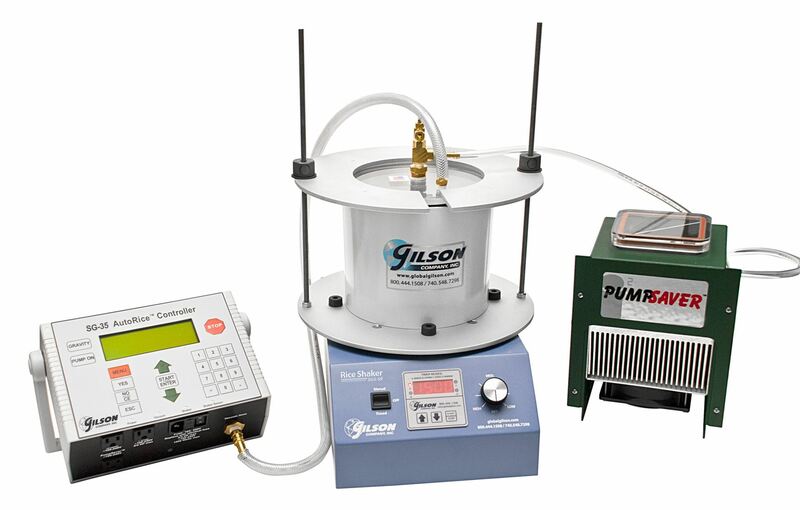 Sample weights can be entered and the system calculates maximum specific gravity results. Data from each test cycle can be downloaded to a PC via the USB port for review to assure adherence to test specifications. Documented test data can be stored and shared, or emailed. The Controller and Shaker Sensor work well with Gilson’s SGA-5R Rice Shaker and are compatible with glass, metal or plastic pycnometers. Compact design allows benchtop placement or easy wall-mounting of the controller. The SG-35 also automates the saturation process for AASHTO T 283 Moisture-Induced Damage specimens. The Controller is equipped with a 3/8in (10mm) hose barb connection and controls vacuum pumps up to 3/4hp to ±0.4mm at 27.5mmHg. 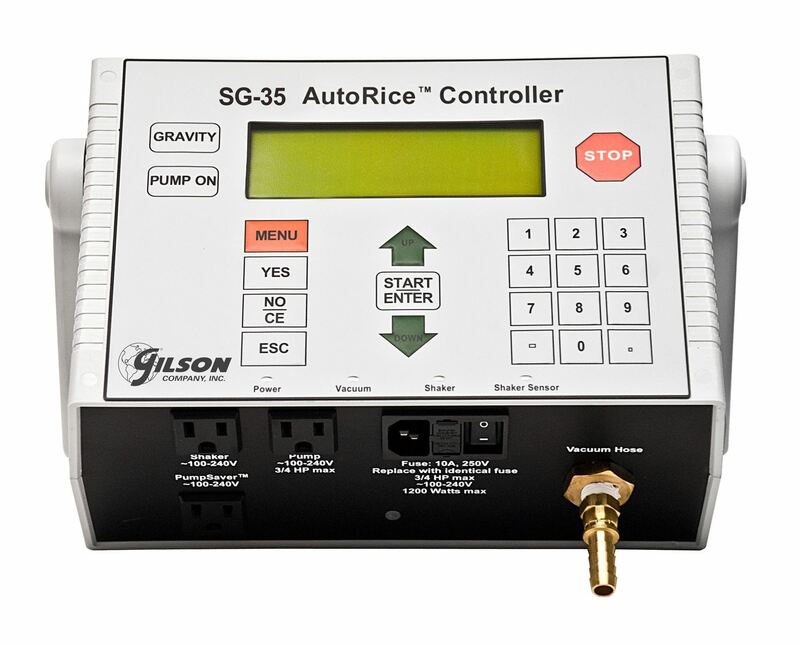 Gilson recommends use of the SGA-128 PumpSaver™Air Drier when operating the SG-35 AutoRice™ device. 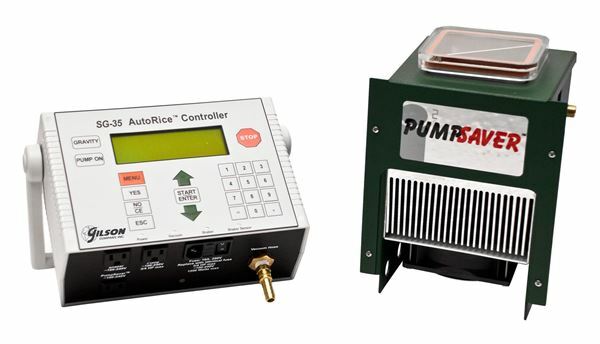 SG-36 AutoRice™ Digital Manometer / Controller w/ PumpSaver™ Air Drier has the same capabilities as the SG-35 AutoRice unit, but additionally comes with the SGA-128 PumpSaver™ Air Drier. Both models operate on nominal 120 to 240V/50 or 60Hz electrical supplies. The SGA-35 Digital Manometer / Controller and SGA-128 PumpSaver Air Drier are each also available individually.